The following Royal Caribbean Majesty of the Seas review is a 100% authentic, 100% real review. Dadtography.com was not provided compensation in any way for this review. I think our family has officially decided that cruising is for us. We love seeing new places, and being able to return to the comfort of the ship between ports as well. This was our first cruise as a family on Royal Caribbean, but our second cruise in 30 days. What was our experience on the Majesty of the Seas on its 3-night weekend Bahamas itinerary? Let's find out! All photos and videos on this post are Dadtography originals. Please don't steal our photos. For us, this particular cruise experience started as we crossed the bridge from the Florida "mainland" to the island where Port Canaveral is located and where our ship would depart. I love that feeling when we approach the port on our way to a cruise vacation - it's the best feeling and you can sense the excitement in the car when everyone first lay eyes on the ship we'll be sailing with. It wasn't all that long ago we decided to "evacuate" Florida after we lost power due to Hurricane Irma. In fact, that trip was only about a month prior. The excitement was no less for this cruise, though. We couldn't wait to get on board and see all that the Majesty of the Seas had to offer. (af) has become our preferred photo editor of choice, and with the upcoming release of the new Luminar with Libraries, there's never been a better time to buy! This is a pretty thorough review, so we've created a topic menu if you want to skip to a specific section of the review. Here's what this review of our Royal Caribbean Majesty cruise out of Port Canaveral, FL will cover. See a map view of Nassau, Bahamas and view the ship's itinerary on our cruise. See an overview and vital stats on the Majesty of the Seas. We review our interior cabin (stateroom) on the Majesty of the Seas. We spent a lot of time at the pool, sundeck and waterpark. Learn more about our bar & dining experiences onboard. Check out a ton of photos from the Majesty of the Seas Nassau cruise. One thing I did appreciate is that the safety drill on the Majesty of the Seas occurs on deck 7, a deck with relatively good airflow compared to other ships I've been on. This was our first experience on a Royal Caribbean ship sailing to the Bahamas, but not our first trip to the popular island destination. We were excited to try a new ship, and our experience visiting Coco Cay would be new for both my son and I as well. My wife had visited the island, but it has been quite a few years. A 3-night cruise is a quick trip, but it can make for a really easy and fairly affordable getaway if you just need to take a break for a few days. Royal Caribbean International is one of the most popular cruise lines in the western hemisphere, if not in the world. My wife and I last sailed aboard the Freedom of the Seas back in 2015, so we were excited to try another Royal Caribbean cruise - this time, as a family. This was our first time sailing aboard the Majesty of the Seas. 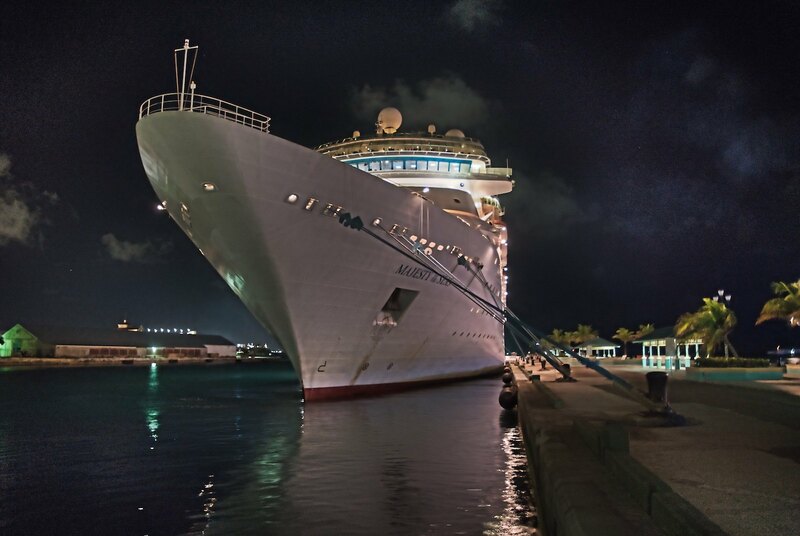 The Majesty is one of Royal Caribbean's oldest ships still in service. It was launched back in 1992, but still remains in service. The Majesty has a distinct look as a first impression, and once upon a time, these ships were pioneers as the first modern "megaships" to be built. That said, by modern standards (2017 at least), they are small in comparison to other, newer ships, such as the newest Oasis class. How are the cabins on the Majesty of the Seas? We decided to book an interior cabin on this particular sailing. In a very unscientific conclusion, we've determined that we sleep much better when we stay in an inside cabin. Some reasons are obvious - no windows means a darker room. Some reasons are less obvious, too. We feel interior cabins are better sound-proofed that balcony state rooms. The interior stateroom we had on this voyage was on deck 3 and was in one of the side hallways. This meant even less foot traffic and a quieter experience, but we also felt like the room was even smaller than normal for interior state rooms. In fact, our room was so small (how small was it?! ), we could barely fit our small family of 3 inside at the same time. It was very difficult for us to navigate from the bed to the bathroom, especially with the fold-away bed down. We would have preferred a bit more space in our room, knowing that you don't get an interior stateroom for the wide-open spaces. This room was just a bit too tight. How are the pool, sundeck and waterpark on the Majesty of the Seas? When my family goes on a cruise together, we go for fun, relaxation and to rest and relax at the pool. Well, my wife and I rest and relax. Our boys prefer to be active in the pool and / or water slides. There are two pools aboard the Majesty. Both pools are on deck 11 and are on opposite ends of the sundeck from each other. One pool is for adults and is the one closer to the front of the ship. The other is for children, and is adjacent to the splash area, "Splashaway Bay". All pools on the Majesty are fresh water. In addition to the two pools and water park for children, there are also a total of four hot tubs on deck 11 as well. Two of the hot tubs are original to the ship and the other two were added during the ship's 2016 refit. The hot tubs are very popular with both adults and children, and were regularly at capacity during our sailing. The rest of the deck 11 sundeck covers the area surrounding the pools, hot tubs and water park. Overall, I really liked the Majesty's sundeck compared to other ships because there's actually a decent amount of lounge chairs that are covered from the sun. Some of the chairs are under the ship's 12th floor while others also had sun umbrellas as well. If you're not a fan of baking in the hot sun during the "days at sea" then this is a great ship to be on. You can still enjoy being outside without all the sun and heat. One aspect of the sundeck that I did not care for was the smoking section. Around 1/4 of the sundeck area has cigarette disposal containers, however, the smoke doesn't stay only in that area, but spread to other areas as well. "Is it true that the food on Royal Caribbean cruises is better than Carnival?" As a traveler that's sailed on both, I hear this question all the time! It's hard to provide a blanket answer to this question, but I think I'm actually starting to form an opinion. Yes, overall in my experience, the food on Royal Caribbean ships is better than on Carnival. That said, there are aspects of each that are better, and just like on-shore dining, any experience can be open to personal preference and interpretation. Click any tab below to learn more about a particular dining experience we had while on the Majesty of the Seas Bahamas cruise. The Windjammer is the ship's buffet dining option and is located forward on deck 11 (the same deck as the pool and sundeck). I've read other reviews that proclaim the Windjammer food quality wasn't good, but they also have the wrong deck listed as well. I simply didn't have a bad experience. I ate here for every breakfast, once at lunch and once for dinner and every experience was good. There is a lot of choice at the Windjammer. It has something for everyone, but doesn't go very deep in any particular area. For example, there will be a little bit of Asian-inspired cuisine, but not a lot. I guess it's a way to get a taste of each, but not necessarily a full meal. I will say their dessert selection was pretty comprehensive. Something I appreciated (but my waistline did not). There are two main dining rooms on the Majesty of the Seas - Moonlight & Starlight (Decks 3 & 4). Unlike other ships I've been on, these two dining rooms are not connected vertically to each other, despite being only one floor away. That provides a lower ceiling than what you may be used to and a bit more of an 'enclosed' feeling. On Royal Caribbean cruises, you participate in your dining experience with others at the same table. This can be both good and bad; it really depends upon who you're seated with. I've sat next to some really awesome people and I've sat next to some duds. If your party is large enough, you may get your own table, but if you're sailing as a couple or as a small family, you may be seated with others. Overall, I thought the food quality was very good in the main dining room. The menu followed a pretty standard format. Each night had a theme with special dishes offered. There was also a section of dishes that stayed constant throughout the sailing. There were some dishes I really enjoyed (the escargot is awesome) and some that weren't all that impressive. But again, that can happen anywhere and it really is very subjective. We didn't dine at every option available, but of the ones we did visit, we especially enjoyed the Compass Deli. It's about what you would expect with a salad bar, sandwiches and soups. We also frequented Sorrento's, which would get very busy when other dining options were closed. The lines to Sorrento's regularly stretched 20+ people long. I always enjoy "behind the scenes" tours, whether it's a bridge tour, galley tour or anything that allows you to see areas of a ship that aren't generally open to the public. When we learned that a champagne brunch and galley tour (called the "Galley Brunch") were offered, we signed right up. The Galley Brunch is $25 per adult. Our son (8 years old) was free, which was pretty nice. You start out by meeting in the main dining room as a staging area. They take attendance and assign everyone to a group to tour the galley (kitchen). You're offered champagne or mimosas as you wait for your galley tour group to be called. Tip: Eat before you go or you'll be hungry before you're served brunch. The Brunch Was Good. The Galley Tour Was "Okay". By the time our group was called, I was already on my 3rd mimosa. Hey, don't judge! The tour through the galley took around 15 - 20 minutes and was led by the executive chef. There were approximately 10 people in our group.The kitchen can be loud and we were in the back of the tour group, so we pretty much missed everything the chef was saying. It was still interesting to see the galley, but we didn't get a chance to pick up any of the stories or facts the chef may have been mentioning. After the tour concluded, we returned to the dining room where we were sat for brunch. It took easily 45 minutes from the time we were done with the tour until we received our food. Next time, I'd probably go for a pre-brunch breakfast to make sure I'm not hungry by the time the food arrives. By that time, it was almost lunch time. I suppose I could do an entire review section on the health and fitness facilities on the Majesty of the Seas. I don't know about you, but I don't go on cruises to keep up my exercise routine. The lack of people in the gym with during the two workouts I did told me that I'm not alone in that thought. 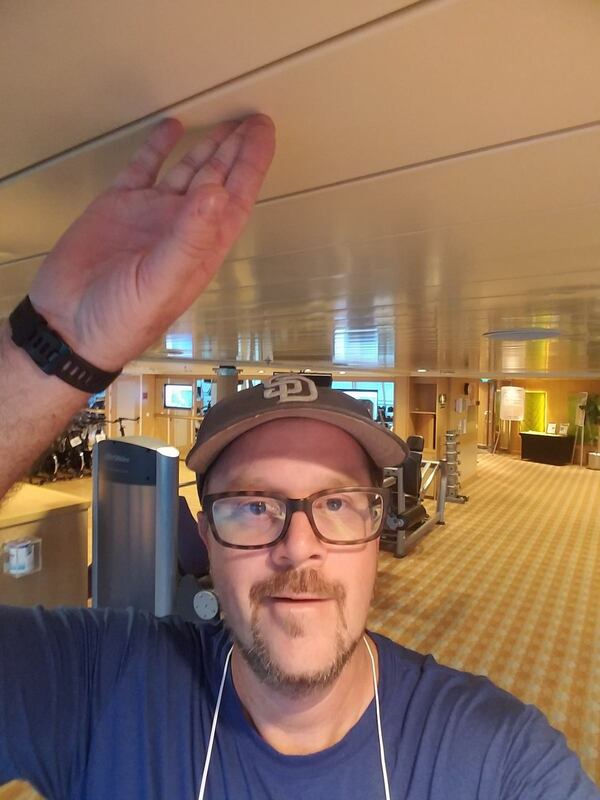 I actually did a pretty good job sticking with my workouts on the last cruise, and I noticed something strange while I was there. Check out the pic and see if you can tell. Long story short (ha), I'm not a very tall guy (5'8" or so). I only had a few inches clearance flat-footed on the treadmill. Anyone 6' would have definitely smashed their head against the ceiling while they ran. Just goes to show short guys are better. And that Royal Caribbean may want to consider raising the ceiling in the gym on the Majesty. Tip: Watch your head on the treadmills in the Majesty's gym. What do you think? Have you been on a Royal Caribbean cruise aboard the Majesty of the Seas? Share your thoughts in the comments below.